At least as far back as the tour in 2010 Leonard has worn a Saints Bracelet. When on a regular shopping trip I saw heart-shaped Saints Bracelets I got the last 3 in the shop, one for me, one for Mandy and one for Leonard. I loved the fact they were heart-shaped as it instantly reminded me of Leonard and the unified hearts. When I was giving one to Leonard his one he at first thought I was showing it to him but on realising it was a gift for him he thanked me and immediately put it on as can be seen in the bottom photo here. It was only on checking through photos today that I realised I had some with Leonard wearing it which I could crop to show it better. 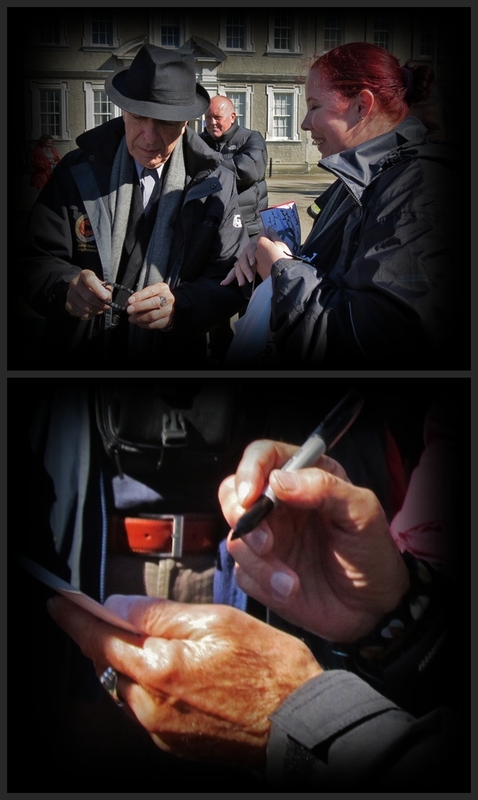 The top photo was taken by Eva Martonyi of me giving Leonard the bracelet. This entry was posted in Dublin 2012, Leonard Cohen, Photos and tagged Dublin 2012, Leonard Cohen, Saints Bracelet.